Water, urad lentil, kidney bean, onion, garlic, tomato, jalpeno pepper, ginger, canola oil, salt, cumin, coriander, turmeric, black cardamom, cinnamon, clove, nutmeg. Saucepan: Remove curry from bag and into saucepan. Add ¼ cup water. If frozen ensure that there is enough water to cover bottom of pan. Cover and heat on medium-low for 7-10 minutes if thawed, or 15-20 minutes if frozen. Microwave: Remove the product from the bag into a microwave-safe dish. If frozen, defrost according to your microwave’s instructions. Sprinkle with water, cover loosely and cook on High for 2 minutes. Stir and cook on high for an additional 1-2 minutes. Boil a Bag: Half fill a medium size pot with water and bring to a boil. Carefully place unopened bag(s) in pot, cover and boil for 10 minutes if thawed, or 15 minutes if frozen. It is rare that an Indian home will serve a meal without an accompanying lentil curry, referred to as Daal. This Punjabi Daal is comfort food at its best and can be served with any meal. It is also perfect as a main, vegetarian dish. This product traveled 44 km to reach our warehouse. Vikram Vij and his wife Meeru Dhalwala, opened Vij’s restaurant in Vancouver BC with the premise that there is no such thing as typical Indian curry. With the opening of their second restaurant Rangoli, a more casual approach to Indian cuisine, the thought to provide their gourmet cuisine for people to enjoy in the comfort of their own homes became realized and a packaged version of their curries were created. Each of Vij’s meals showcases the beauty and taste of different Indian spices in combination with locally available ingredients. They make their our own yogurt and cheeses, and roast and grind all of their spices. They also make their own pure ghee (clarified butter), which is a cherished form of cooking oil in India. Vij's Rangoli sells frozen and refrigerated ready-to-eat Indian dishes that were originally developed at world renowned Vij's Restaurant. 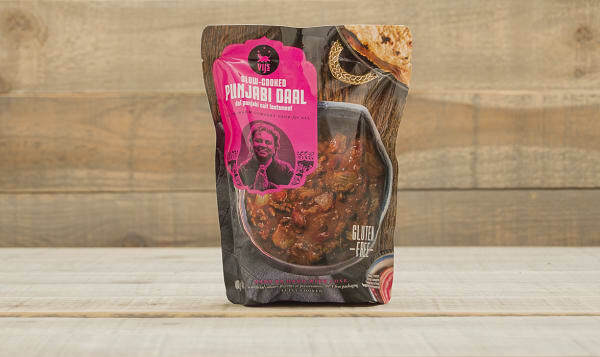 All of the frozen packaged meals are made locally at Vij’s own production facility in Surrey, BC and are free of any preservatives or artificial flavours or colours. Their dishes can be reheated in various ways including “boil-a-bag’ (package submersed in boiling water), microwave and saucepan reheating.